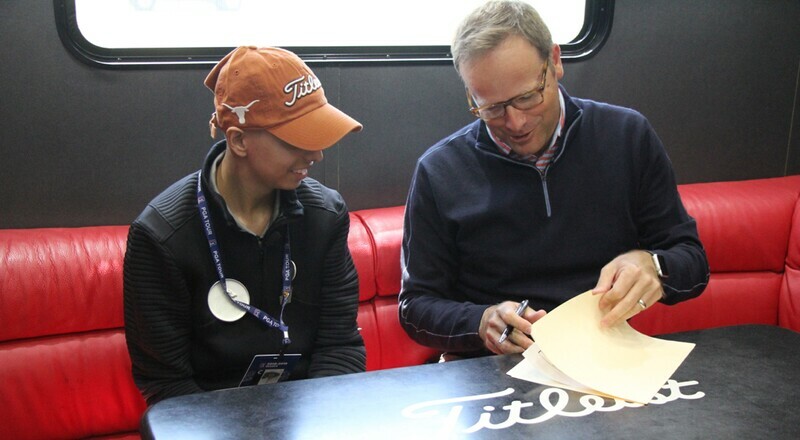 Prior to the 2019 Valero Texas Open, Jordan Spieth, with the help of the Make-A-Wish Foundation and the PGA TOUR, gave cancer patient Alex Trevino, Jr. a special inside-the-ropes experience before he was brought in as an official Titleist team member. While it’s not uncommon for Titleist to sign players, for a golfer, it’s one of life’s most celebrated achievements. After all, Titleist is among the most recognized brand names in all of golf. Some may go so far as to call it life-changing. As one of the most outgoing and friendly players on the PGA TOUR, it’s not uncommon for folks to have the opportunity to rub elbows with 11-time PGA TOUR winner and 2015 FedExCup champion Jordan Spieth. To some, it’s a once-in-a-lifetime experience in itself. 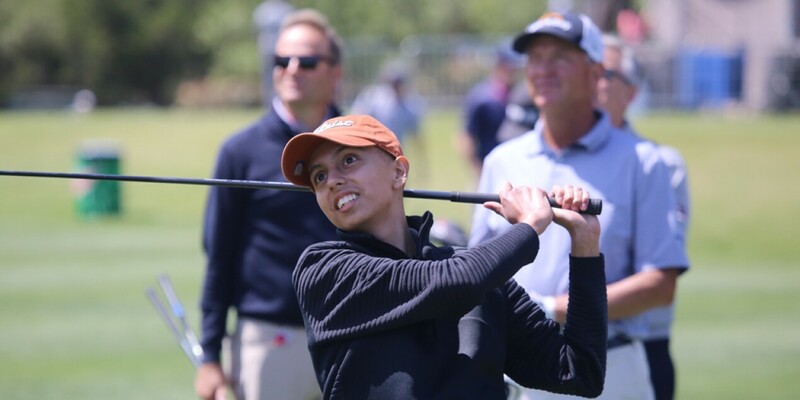 For one young man making his way through life the best way he can, life-changing and once-in-a-lifetime experiences became one Tuesday at the Valero Texas Open. This is the story of how it came to be and how it will sustain Alex Trevino, Jr. through the rest of his life. People who make the decision to go at life alone are one of two types. Most are naïve and eventually stand down. The unwavering others forge ahead with a rare level of courage so astounding that it will define them until they’ve delivered their last breath. It’s a story of despair or repair. The thing is, though, who is who can only be truly determined when faced with life’s most challenging elements. Texas native Alex Trevino found himself at one of those most difficult crossroads in September of 2017. That was the first time. He proved to be among the courageous few. And, he had yet to celebrate his 15th birthday. Alex began experiencing pain in the back of his neck. Instead of it going away, the pain proved to be almost unbearable. So, too, would be the news. Barely a teenager, Alex was diagnosed with Ewing sarcoma. The hardest thing to imagine had become a stark, glaring reality. Doctors, sadly, were wrong. But, in May, after starting treatment shortly after the diagnosis, Alex’s cancer went into remission. He and his family clung to hope. As fate would have it, in November of 2018, Alex was again diagnosed with Ewing sarcoma. This time, though, it had metastasized into his lungs. Alex took to the game of golf at a young age and became quite a player. He was well on his way to big things within the game as a teenager when news of his illness broke. But, with a determined spirit, he made it through the first setback. 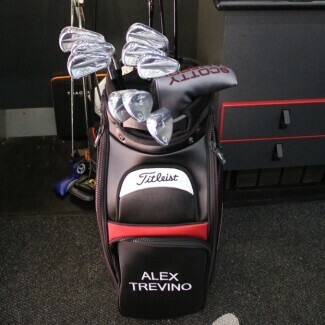 In the Titleist equipment at the Valero Texas Open, Alex Trevino, Jr. signs his one-day contract with Titleist. Alex underwent surgery to remove the biopsy, but the doctors had to cut the muscle, making it challenging to swing a club. Recently, though, doctors told him he can start practicing again. As opposed to taking treatments three weeks apart, Alex decided his best chance for survival would be to compress them into two-week intervals. What that meant was that very strong medicine was inside his young body continuously. Courage aside, not many people – especially kids – could conjure the fortitude Alex did to increase every chance of survival. Then again, not every kid is Alex Trevino. On his terms, Alex was going at life alone. “I’ll tell you a story as to why he did it,” said Alex Sr. “He played team sports and he was really good. But, they were team sports. So, if he committed an error in baseball or someone didn’t get the out needed, his feeling was that he let the team down or because of another’s error, he didn’t feel as if his work made a difference. I told him it was a team sport. I told him that golf is an individual sport, and you have nobody else to blame or let down.’"
The words resonated with the young man. 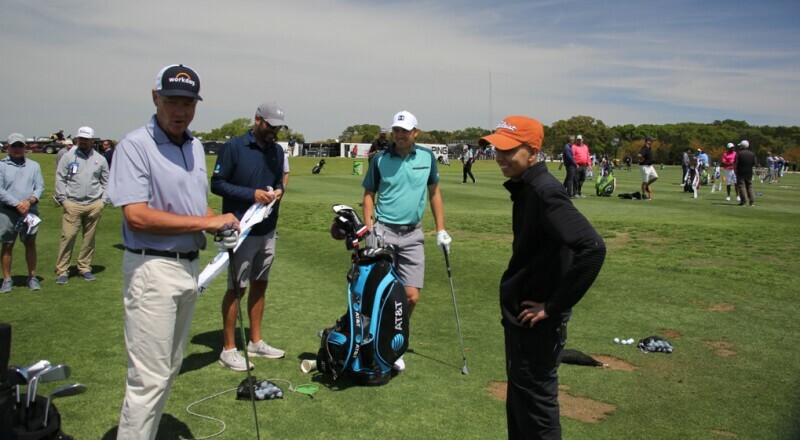 Through the Make-A-Wish Foundation and in conjunction with the PGA TOUR, Alex was treated to a VIP experience at the Valero Texas Open on Tuesday which, among other things, featured one-on-one time with Spieth, who finished second in his first start at TPC San Antonio in 2015. In addition to walking several holes with Spieth during Tuesday’s practice round – and even draining a few impressive putts – Alex was also taken to the Titleist equipment truck for what he was told would be a quick tour. It was there where, to his surprise, he was officially signed to the Titleist team. Davis Love III, Michael Greller, Jordan Spieth and Alex Trevino, Jr. on the range ahead of the pro-am on Wednesday. As part of his VIP experience Tuesday, Alex and his family were treated to a behind-the-scenes tour of the Valero Texas Open media center. It included a special, impromptu press conference where Alex was asked to make a few comments. He sat in the chair reserved for each year’s tournament champion. Alex Trevino, Jr. may have made the choice to face this part of his life on his own as best as he can. However, he would hard-pressed to find anyone, family or friend, who would agree with him that he hasn’t given them just as much. Memorable as it was, it’s also fitting for a kid like Alex to refer to it as one of the most amazing days of his life, but not the best. The most amazing day of his life, he knows, will be tomorrow. And, the best one after that will be the next day. The most amazing day of Alex Trevino, Jr.’s life will always be tomorrow.